Over the past several lessons we’ve talked about how to create a website. But what if you don’t want to build your own website? Maybe it’s not fun for you, or maybe it’s just not worth the investment of your time. Outsourcing is subcontracting a job or a task… or a collection of jobs or tasks… to a third party. Outsourcing vs. Out-tasking: “Out-tasking” is when you hire someone for a particular task or one time project, versus outsourcing on an ongoing basis. However, I use the term outsourcing as a catch-all. Outsourcing vs. Doing everything yourself: If your goal is to build a long-term sustainable business that runs without you, then you’ll need to hire some employees and/or outsource. Outsourcing vs. Hiring Employees: Many online business owners may find outsourcing to be a more economical choice to achieve many of the tasks and processes that I’m teaching. You can outsource almost EVERYTHING. -son/daughter/relative… local college kid, etc. -know exactly what you want. -decide if you want to work with someone overseas, or in certain countries. -look at reviews and get a referral. -Idea: make a screen capture video! 2) If yes, choose a provider and make it happen! 3) Start thinking about what you can outsource, and develop an outsourcing mindset. 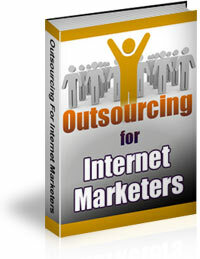 Today I’m offering an ebook which explains how to outsource for your Internet-based business. It is a brand new exclusive ebook created for Eric’s Tips. As always, you are welcome to post your questions and comments below. Feel free to let us know your outsourcing successes, or recommended freelancer sites. It does not make me change my mind. ALL I REQUEST IS CANCELLATION OF MY ORDER AND A REFUND. We’re not sure what was purchased. Please post your receipt and request at our helpdesk, for quick assistance. Excellent information. Thanks for your thoroughness. I am enjoying my learning. I have done something that I never thought I could do and though it took me a while to get started, I am looking forward to each lesson. I prefer to Do it by Myself first, then hopefully, as my business grow, outsource some new project to kept my business growing faster.